Ted Cruz’s Trump jokes land with a thud at Fox News debate. 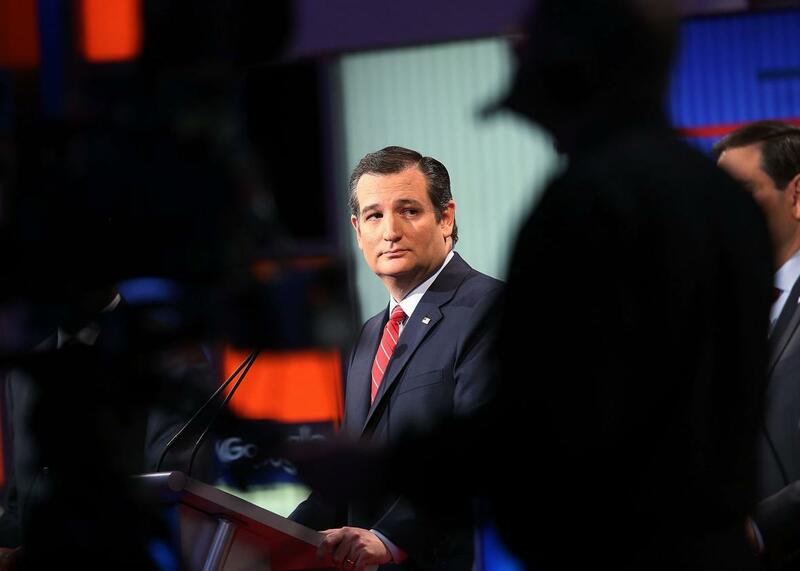 Ted Cruz participates in the Fox News debate on Jan. 28, 2016, in Des Moines, Iowa. DES MOINES, Iowa—Ted Cruz spent much of last year as Donald Trump’s successor, campaigning in the slipstream of his bluster in hopes of eventually nabbing his supporters if he ultimately dropped out. On a Trump-less debate stage here on Thursday, though, Cruz showed that it’s easier to be the understudy than the star. Fox News’ Megyn Kelly opened the night by asking Cruz to weigh in on Trump’s decision to play hooky from the final debate before Monday’s Iowa caucus—a political gimme if ever there was one given that Cruz had spent the previous 48 hours looking for new ways to call Trump a coward. The Texan, though, responded by trying to channel the real estate tycoon for big laughs. He did neither successfully. “I’m a maniac and everyone on stage is stupid, fat, and ugly,” Cruz said before adding: “Now that we’ve gotten the Donald Trump portion out of the way …” There was some applause, but it’s a safe bet he was expecting that punch line to land a whole lot better when he was practicing it in his dressing room before walking out on stage. Say what you want about Trump—and I certainly have!—but his jokes never seem scripted and his (often offensive) impersonations never rehearsed. It’s one of the things that his fans say they love about him. Things, though, only got worse for Cruz when he tried to improvise. After a prolonged back and forth with moderator Chris Wallace over the tone of the night’s questions—a fight Cruz has won onstage before but was losing on Thursday—the fiery senator attempted to save himself before it was too late by going back to the Trump’s-not-here well. “I will say this, gosh, if you guys ask one more mean question, I may have to leave the stage.” The line may have worked in a different setting—or, more likely, from a different candidate—but coming from the always-combative Cruz, it took a beat too long for anyone to be sure he wasn’t being serious. If Cruz needed a reminder that a debate is won with applause and not laughter, Marco Rubio provided it moments later when he offered his no-nuance version of the line. “Don’t worry,” he said. “I’m not leaving the stage no matter what you ask me.” The crowd cheered.